It was a shocking revelation to hear that Assassin’s Creed Origins has been in the works for such a long time. For the last three years, various Ubisoft teams have been getting the game ready, and although many details about it had already been leaked over the past few months, there was still plenty of the game left to enjoy after its official announcement during Ubisoft’s press conference. Assassin’s Creed Origins takes place in Egypt, many years before any of the previous entries in the franchise. In fact, the story behind the game claims that that’s where the era-long battle between the Templars and Assassins started, back when Egypt was at the high point of its cultural prowess, long ways into its cultural assimilation by Greece after Alexander the Great’s tear through Asia and Africa. 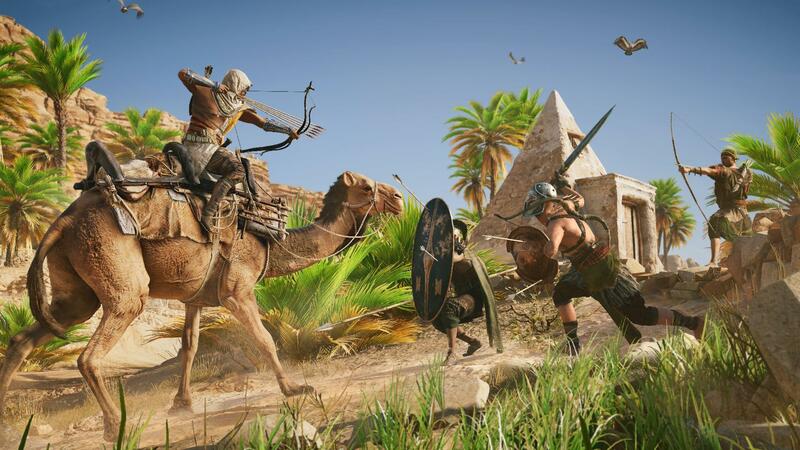 It goes without saying that this setting has hardly seen any attention in games outside of Civilization and Age of Empires, so it’s exciting to see Assassin’s Creed do its thing back in the age of pyramids. My demo of the game took me through two separate sections in the game — a story mission and a wave-based fight at a coliseum. I started with the story mission early on in the campaign. It had protagonist Bayek, a Medjay (a desert person from the lands of what is now Sudan), hunt down a corrupt priest that has taken ahold of a local settlement. But this being an Assassin’s Creed game, I had a bit of sleuthing to do as well, since the person rescued from the clutches of the priest happened to hold info on a relic that the Templars were after. That’s where Origin‘s ace came to play, Bayek’s hawk. It acted as an aerial scan unit, and looks like it’ll eventually turn into a combat buddy after some upgrades. He helped me find the two possible spots where that artifact could be, a boat and a blip underwater. The press conference footage showed that he’s also used to mark targets and other important environmental elements, as is customary to Ubisoft’s focus on filling maps with icons to explore. I didn’t mess with that function, though. I had a great time playing Assassin’s Creed Syndicate last year. It was a breath of fresh(er) air to the franchise, and brought much needed simplicity to the convoluted mess that the earlier titles became over the years. Origins feels like a natural continuation of that, even if it seems to stumble on itself thanks to some weird changes to the controls. Basically the traversal got flipped with the combat. Now all the running, dodging and jumping is handled by the face buttons, which threw me off for a loop when starting the demo. After years of mindlessly holding the right trigger and letting my assassin do his or her thing, I was suddenly drawing my sword and terrorizing the populace. Getting around was easy enough after getting over that hump, though, thanks to Bayek’s faithful stallion. For the few instances where I had to leave the comfort of his saddle, getting around felt just like current Assassin’s Creed: to the point, with lots of contextual interaction; that is, one button does more than just one thing. Fighting also changed thanks to the different controls. At first, it seemed like a good fit to have a control scheme similar to Demon’s/Dark Souls — you know, heavy and light attacks mapped to the right bumper and trigger, defensive moves to the left ones — but none of the speed and finesse of From Software’s series was there during the few instances of combat I went through during the demo. Bayek moves quickly, sure, but he isn’t nearly as responsive as he should be. So even though the controls were the same, I had to adapt to a different mindset when fighting, basically reverting back to the old Assassin’s Creed model of creating openings by jamming heavy attacks while avoiding incoming attacks as Bayek slowly recovered. It felt really slow and not at all exciting, something that I’m hoping will change by the time this hits shelves. Problems and all, I couldn’t help but feel like Assassin’s Creed Origins is a step forward for the series as a whole. After a successful attempt of bringing the franchise back to the forefront with Syndicate, it seems like Ubisoft has taken the time to create something worthwhile. For as insane as the story for Assassin’s Creed might have quickly gotten over its ten-year, over twenty (!) game run, Origins’ premise actually feels new and filled with potential. Assassin’s Creed Origins is set to join a very crowded October this year, releasing on the 27th of that month for PlayStation 4, Xbox One, and PC.